Agapanthus, also called the love flower, are tall with lily-shaped flowers that are on top of thick, dark green stems giving it the nickname African Lily, or Lily of the Nile. The stems are usually one to three feet in length, when they are fresh, they usually have one-third of their blossoms opening, with the rest in bud stage. The blossoms turn upward. If you shake the flower gently, the blossoms will not drop. Agapanthus comes in shades of light blue to deep purple- blue, and the more uncommon white. The exotic look of these flowers makes such a statement that when just a few stems are used they stand out alone. If you want, you can cut the stems very short and use them in mixed arrangements for a more old-fashioned appearance. They have a strong line element with a bold, but spacious quality, Individual florets can be wired and taped for corsage work. Agapanthus is recognizable to the knowledgeable eye instantly. The length, sturdy stem, and lily-shaped blooms are characteristic to the Agapanthus or the Lily of Nile flower, as it's beautifully nicknamed. It is a big and attractive flower, so much so that it's sometimes enough to use just one or two in an arrangement. That’s how much it stands out and apart from any other flower. The shades Agapanthus comes in are white, deep purple and deep blue making them appear even more royal. If these exotic looking flowers have taken your fancy, you are probably wondering how and where to use them.Its bloom is a unique and mesmerizing one. The bloom carries a special meaning with it too. The word 'agape' means 'love' and ‘anthos' means ‘flower’ in greek. Their showy flowers and stiff stalks with the addition of shiny leaves make them a perfect part of any location they are put in. Appearance wise, they will always add the charm to your decor. 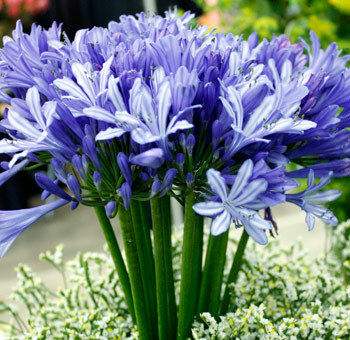 One of the best variants, the Blue Agapanthus will look lovely if decorated in clusters. Adding grace and elegance to the place, they make a perfect fit for decorations, be it for weddings, festivals or other occasions. These tall beauties bloom for months from early summer to fall, and their leaves will come in different shades and tints of green. The beauty of the Lily of Nile flower is that it's both deciduous and evergreen. The subtle look of the flowers makes them ideal for a lot of decorative elements and themes. You could employ them in bulk for a setting that is probably winter-themed. They would look great for a spring or summer occasion too if used aptly. Gather creative ideas to put them to use, and you are good to go! Not just where they are grown, they are a highlight, wherever used! This flower of love stays fresh and vibrant for quite long if cared for, properly. The Lily of the Nile flower comes in a lot of variations. They have different colors shapes and grow quite differently from each other. We've listed some of the most commonly found types of Agapanthus. One of them is Agapanthus Arctic Star. It is known for its hardiness and significant growth. The Agapanthus Arctic flowers beauty does not fade even when it's not in bloom. It manages to look attractive and capture attention for weeks with its pure white flowers atop a sturdy stock. Another variety is Agapanthus Africanus. Obvious to the name, this variety of the Lily of the Nile flower is native to South Africa. Clusters of fragrant blue funnel-shaped flowers are characteristics of this type of the Blue Agapanthus. They rise high with sturdy stocks and evergreen star-shaped linear grass-like leaves. The rounded bunch of flowers looks beautiful even when not in bloom. Agapanthus silver moon is another variant of this flower whose beauty lies in its dwarfish size and attractive silver strap-shaped leaves. This variety can easily be considered the most beautiful out of all the Agapanthus. They are perfect for flower arrangements especially during daytime affairs as they bloom with lavender-blue flowers atop the sturdy stalk. Another variety called Agapanthus Peter Pan is a dwarf Lily and just as attractive. The Peter Pan variety blooms a cluster of blue colored flowers that are well rounded and have a darker vein running in the middle of each flower. Their leaves are evergreen, narrow and strap-shaped but loose making it perfect for smaller spaces.Agapanthus Northern Star is another flower that grows up to 24 – 30 inches in height and is quite striking in its appearance. Their showy round cluster of deep purple flowers grow at opdeciduous arching leaves that have a deep violet base. These two have the typical sturdy stalk like all other varieties of the Lily of the Nile flower. Another variety, Agapanthus Luly is particularly charming and more exotic looking than others because of its clusters of striking pale blue, star-shaped flowers. Blooming from summer, they majestically rise atop semi-evergreen arching dark colored leaves with the height of at least 30-40 inches. Such a great variety makes it easier to use and suit these beautiful blooms for specific occasions. Be it. A wedding or a baby shower, they would look the prettiest! 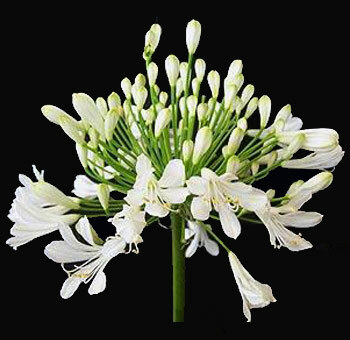 Where To Buy Agapanthus Online For Best Quality And Reasonable Price? It's possible to not only find agapanthus for sale but also find them for amazingly cheap prices. The Lily of the Nile is not a typical flower. So, finding it may be a task, but it's not impossible. 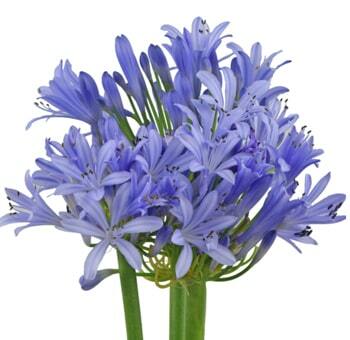 Many trusted online florists could cater to your Agapanthus needs. One of the most renowned being Whole Blossoms. You can trust them for your wedding decorations, and they will guarantee a fresh flowers delivery. Buying in bulk from online stores like these would ensure you the best quality as well as budget-friendly flowers. Order them for your special occasion and put them to use as per your liking. Use them as centerpieces, in flower backdrops, for making bouquets, etc. The best part is, all you have to do is select the flowers of your choice and with a click, you are done! Get them delivered right at your doorstep, whenever you want, wherever you want! The 24/7-hour delivery service is a blessing for those planning an event. Capture this flower of love into your decoration.